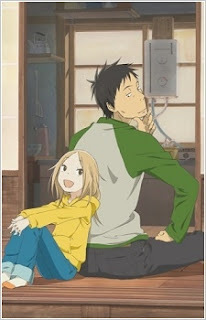 Usagi Drop tells the story of Daikichi Kawachi, a 30 year old single man whose thoughts rest solely on working, until he met the daughter of his deceased grandfather, Kaga Rin who is aged just 6 years old. As no one would want to take Rin, given her status as an illegitimate child, Daikichi offered to let Rin stay in his home. And then, his life would change to adapt to his newfound status as a single-parent. Before I begin, there is something I want to state here first. It was questionable, as to how a 70 year old male can still impregnate a younger female and actually had a kid? I mean, why would that girl want to be with the old man? Is he that charming? Or is he reminds you of your grandfather? If so, then why would you make a child with him? That was truly questionable to be honest. As confusing as it sounds, it is one of those absurd backstory that an anime can offer, which is fairly rare at this moment. 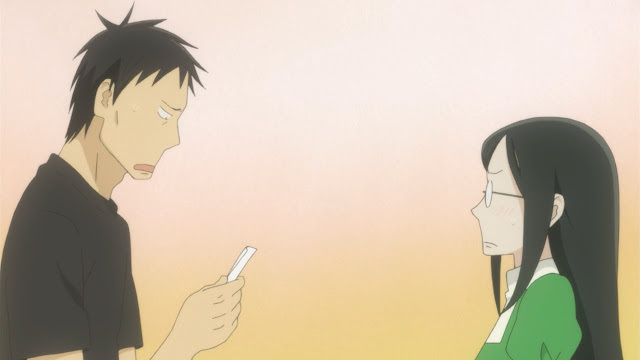 Usagi Drop has a simple premise, a man adopts a girl and we get to see how his life changes shortly afterward. While it was simple, the premise worked wonderfully. Of course, the family member confusingly discussed of how his grandfather got the kid in the first place [Just like me] and tried to decide where they should place Rin, as her status as an illegitimate child causes no family member want to take her in. 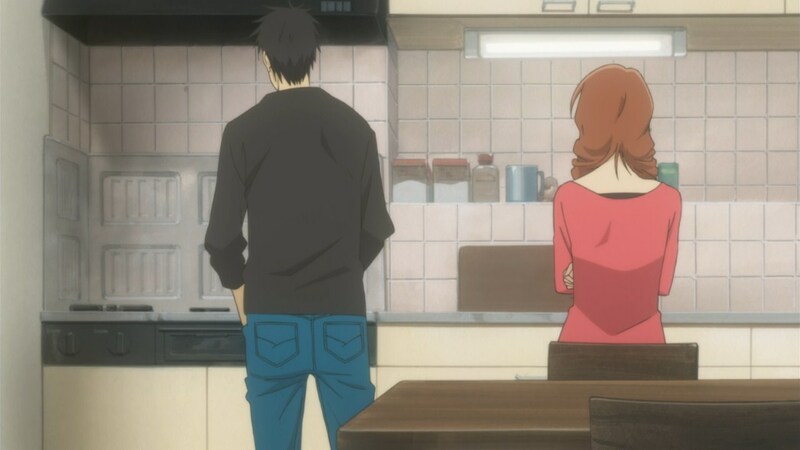 Daikichi steps in and allowed Rin to stay in his home, much to the chagrin of his other family members, but given Rin’s initial affection to Daikichi, she decides to stay with him. It was a remarkable first episode, one where it get me to continue. You know how first impression is always important right? But, as important as it is, it does not judge the quality of the final product. If I am asked for an example of an anime, think Kumamiko, an anime so good at it’s first impression, yet it loses steam in the middle and just dropped flat late in it’s climax. Is there any reverse example of this? Look at Himouto! Umaru-chan that has a remarkably weak first episode but it excelled at what it does later. All in all, first impression is important not to judge the quality of it’s final product, but to grab attention of what it is good for and sets the audience in motion of what that product have in mind. Usagi Drop does this marvelously. And a simple yet effective premise as the show's strongest point. And then, we get to see the interaction between Rin and Daikichi. Daikichi’s status as Rin’s guardian is intriguing and their interaction together was delightful to be honest. First, Daikichi was troubled of how to deal with Rin, since he was never a father to begin with, but slowly becoming adapted to his newfound care and gradually attached to Rin as the series progress. While he is always as caring as he is, he was not the best man to rely on when it matters the most, but watching him gradually able to do things he wasn’t originally meant to do at first is remarkable. How their bond grow was also something to witness. 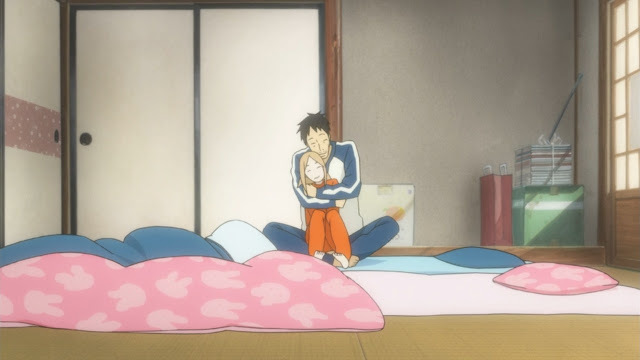 From just an acquaintance at the first episode, and later in the series, their distance was lessened dramatically, to the point where they snuggle to each other like father and daughter. I truly enjoyed that. Daikichi even referenced to this change as a tongue-in-check, remarking that this change is necessary in his life, given his boring and generic life as a salaryman. Thanks to Rin as well, he was able to fall in love with a widowed mother, Yukari, who had a son Kouki , who is the best friend of Rin. I was always excited to see Daikichi and Yukari interact with each other, and how Daikichi always blushes whenever he talks with Yukari, given his crush to her, but ultimately decides not to advance their relationship, since he felt that he knew what she is going through and does not want to interrupt it. This was a bad decision by Daikichi though, as their interaction together was one of the best, and provided a great family bond between the two family. 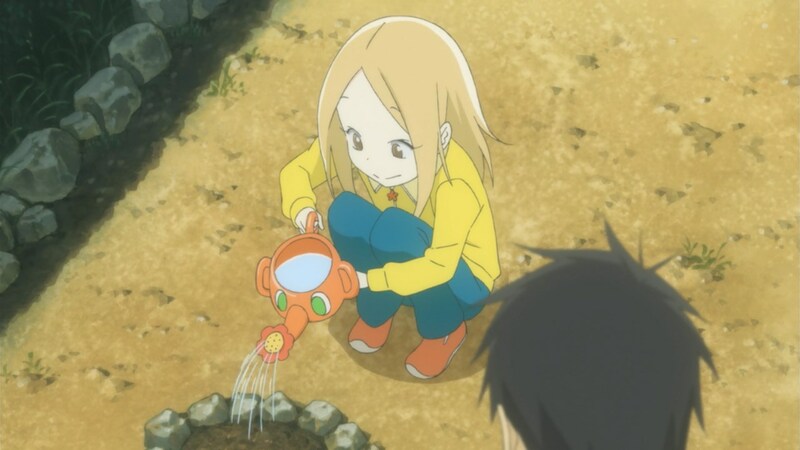 Every episode deals with how Rin interact with new things, such as how to handle cooking, visiting her father’s [Which she calls grandpa] grave, and even when she got sick. Seeing her interaction with all the things was so cute and gives off this genuine children feeling. A child is always curious and loves all things who loves them back, and this is what Rin does. 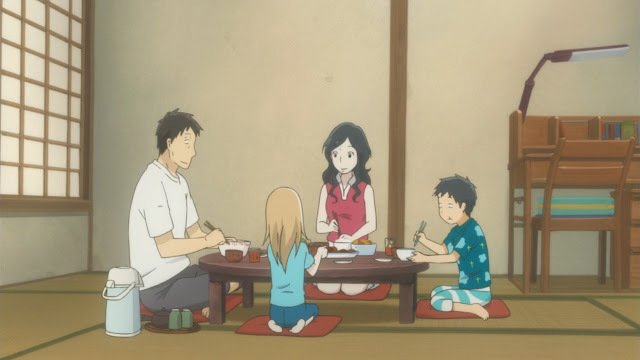 At first, Daikichi’s family was a little hostile to her, but after she opened up to them, Daikichi’s family accepted her as a member of the family as well. Even Daikichi’s mother was always pleased whenever Rin visited her home, when she was very hostile to her at first. And how Daikichi and Rin interact with each other. One thing that Rin has never done is meeting her actual mother, Masako, who is a mangaka. Unfortunately, Masako’s appearance in the anime was too limited and we only know that she was stern and unwilling to see Rin, given her status as a mangaka as that life is very busy and hectic for one to have a children. Perhaps she does not want to trouble Rin, or she does not want Rin to be neglected? Who knows, as like I said before, her appearance was limited. Her only memorable moment was seeing Rin from inside a bush and witnessing how she has grown. Even her compatriot told her that they resemble each other, which means that she truly is Rin’s mother. As her appearance was limited, so was her characterization, but those appearances managed to tell us who Masako was and her personality, so it was enough. But what about the other characters? Fortunately, Usagi Drop manages to divide it’s time accordingly and given all the characters enough characters for us to remember them. Oh, minus those two father who appeared so late in the game. As the main lead, Daikichi and Rin had their personality and character fleshed out the most. Masako's appearance was limited but was acceptable. Yukari and Kouki,the family that I mentioned earlier, was really fleshed out as well. As we spectate the show, we understand how caring Yukari is to her child and despite Kouki’s complaint of how she scolds him too much, she really loves her child and Kouki too loves her mother. Yukari also apparently also has a feelings for Daikichi, but perhaps she is thinking the same thing as Daikichi and decides not to advance her feelings for him further and just treat each other as an ally in single parenthood. Kouki himself got enough personality, through his interaction. Whenever he speaks, he never speaks like he has emotion, but his daily routine and antics presents how an actual 6 years old boy behaves. He was rowdy, playful, and also annoying, but that’s how a boy behaves right? Correct. He even got Rin in trouble at first, but when he anticipates himself to be in trouble, Daikichi instead thanked him for sticking with Rin to the end, and I liked that. There’s no need for maturity in a kid like Kouki, as sometimes, kids just need to be kids. Kouki and her mother, Yukari, were treated as equal as Daikichi and Rin in the show. 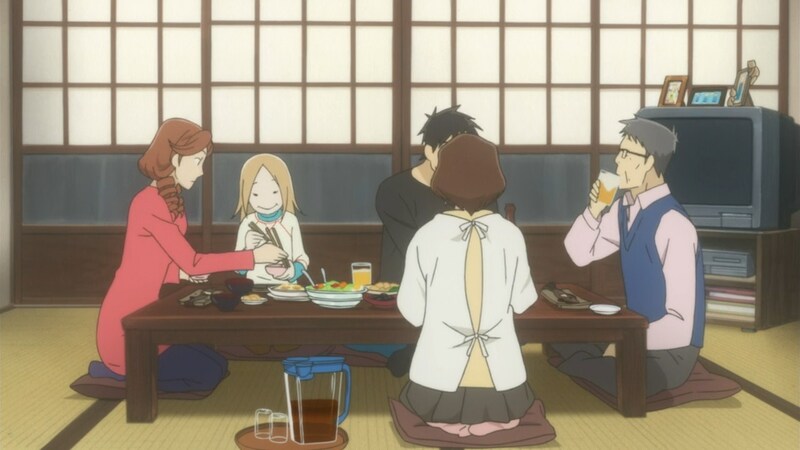 The dinner between the two family also offers one of the strongest scene in the show. Rin, on the other hand, was too mature for a kid. She can cook, she wakes up earlier than Daikichi, and even scolds Kouki when the boy antics become too annoying. At one point, she even felt sorry for giving Yukari her fever, though Yukari assures her that her fever does not originate from her. Despite all that maturity, her childish antic counteract all that. She still wets herself in the bed, to which she claims to be a sweat, and got satisfied in just a simple accomplishment. Her satisfied face is always a great scene to behold as she truly captures the mood of childrens. Kouki and Rin truly was a great presentation for children in anime. Daikichi is, at first, portrayed to be a generic man who thought of nothing but work. But, after he takes Rin and becomes her guardian, he changes. He becomes responsible for her and felt apologetic whenever she picks her up late in the daycare. He even went as far as changing his job in his firm to better match Rin’s time to return, much to the disappointment of his co-workers, but he felt that it is necessary for him. 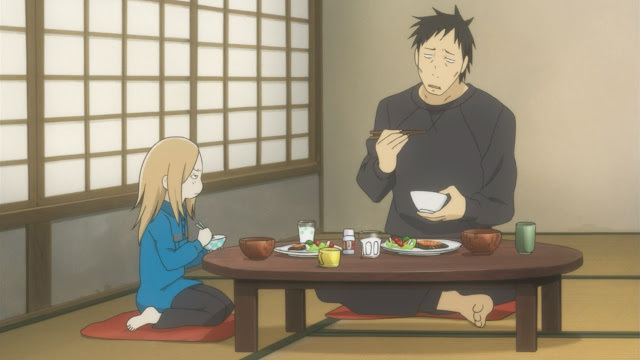 We see Daikichi matured from a man, to a father in this anime, and that was intriguing. While being as childish as possible, Rin was a little bit too mature for kids her age. And Daikichi shows how his bland lifestyle got changed upon becoming Rin's guardian. If I am talking about the aspects that this anime taught us, it taught us a few things. First is how the death of a family member can affect someone greatly, as the death of his grandfather changes Rin greatly and Daikichi’s life. While this is simple, the second one is more important. Then, we have this lesson of parenting. Parenting is never an easy task and the parents need to sacrifice a lot of things just to have a child. There are several references made about this, such as how Daikichi’s sister mentioned of how she does not want to have a child yet since she needs to sacrifice much of her free time to bear her child and how she needs to care for the child after it has been born, and how Haruko, Daikichi’s niece I think, suffers after her marriage as she constantly nags Daikichi of how difficult the life of becoming a mother, and the fact that she no longer feels love for her husband. 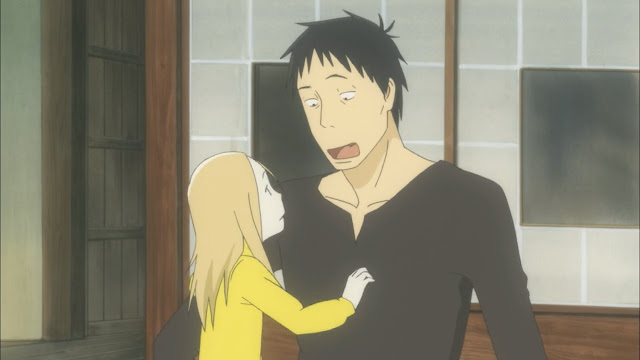 Anyone who thought of becoming a parent can consult this anime, as it deals with that matter most of the time. The difficulty of becoming one and the responsibility of one. And how fun and heartwarming can it be. Voice acting was good, and Sayaka Ohara seems like she has been long-since typecasted as a mother figure her, given her voice as Yukari. This might perhaps be the anime that introduced child voice-acting, one that was made popular by Barakamon several years later. Rin’s voice actor, at the time of the show’s airing, was still around 6-7 years old, and her performance was decent but not solid. 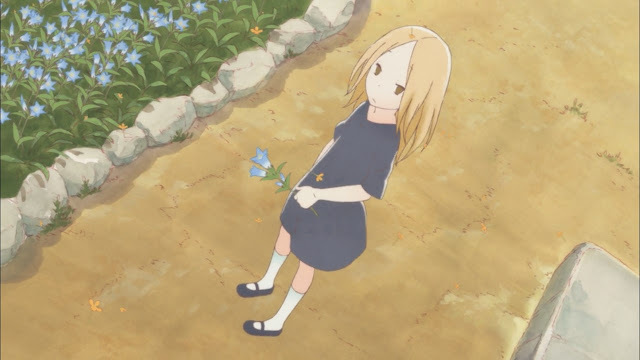 She was great at first, but started to lose steam at around episode 9 or so, as she seemed to be weaker than she used to be, but still managed to capture the essential feeling of how a child in anime should behave. 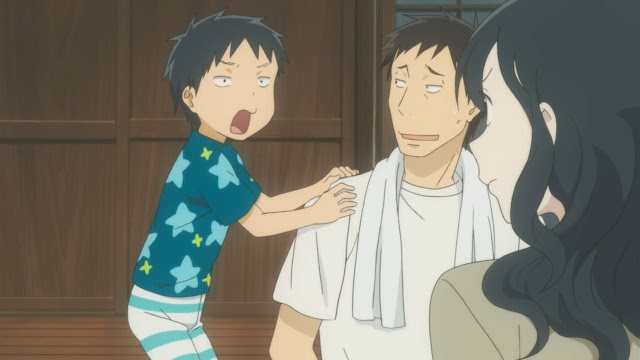 Perhaps Barakamon took a lesson from this anime? I don’t know. The animation was great, especially when it is hand-drawn at times. The animations of the characters gestured their emotion perfectly and articulate their feelings at the perfect moments. It might look limited at times, but it articulates the story well. The background music was spot-on as it fits the filial atmosphere it needs to fit into flawlessly. No music sounded out of place and everytime one is heard, it really captures the moment. However, my complaint of this show is regarding it’s length. At 11 episodes, it is too short. I did not read the source material before or afterward so I don’t know of it’s faithfulness towards adaptation but I can say that this is too short. After looking up information, I found out that the manga series ended before the airing of this anime began, which begs the question of why didn’t the studio adapt all of the source material and makes the anime a 20+ episodes? Perhaps there is something about the audience or the rating, but I can say that the decision to make it just 11 episodes hurts really bad. Perhaps it wants to shy away from the controversial ending of the manga? I don’t know, I haven’t read it yet. Perhaps I will, but now is not the time. While the anime is definitely good, the length of the show truly shows it's weakness. 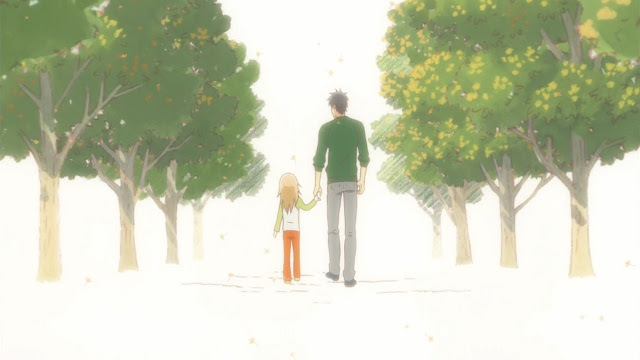 All in all, Usagi Drop is a wonderful series that tells the story of someone who had to become a parent. It articulates the story from the parents’ point of view and how they interact with their child. The story, despite telling several good moments and wonderful interactions between the characters, pointed out several true-to-life facts about parenting and how becoming one affects the mentality of someone, how difficult becoming one is, and how it changes the life of someone upside down. It was a tough choice, but a choice presented to everyone in life, whether they want it or not or they’ll accept it or not. Recommendable to almost all anime audiences, even those casual anime viewer, as the fuzzy feeling of the anime might touch the heart of those who watch this. The pace might be a bit too slow for some and the premise might be questionable, but it is still one enjoyable and delightful ride to ride on. 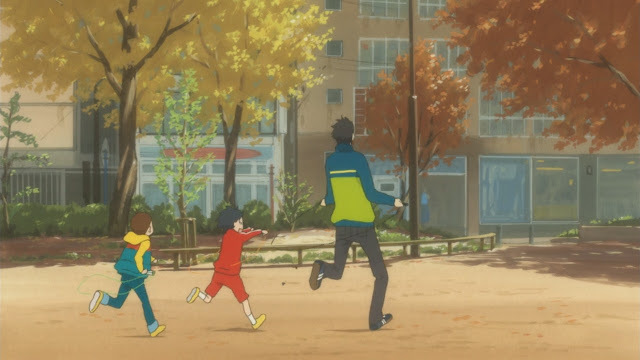 A great show, possibly the one that paves way to the current children-related show such as Barakamon and the others. 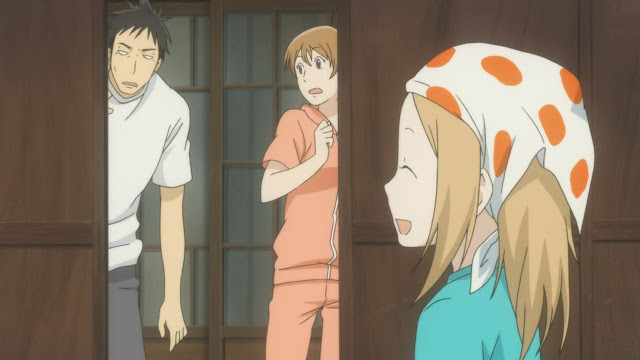 The good : Great parental relationships articulated in anime. Wonderful characterization, except for some characters. Great background visual and elements. All of the feel-good moment worked wonders. The bad : Too short in episode count. Rin’s voice performance felt a bit weaker later. Highlight moments : Almost every moment in the anime is a highlight moment, one that can never be missed. Final score : 4. out of 5. A truly wonderful anime, only held down by it’s lack of episode counts.